What a week!! Filled with lots of unexpected twists and turns, exciting work stuff and finally getting ready to move to our new home next month :) So since there's a bunch of things going on, I don't have much time to whip up something in the kitchen, but what I do have is a beautiful beetroot soup recipe for you.. It was featured in last month's BBC Good Food ME.. Simple, original and delicious! Heat a little olive oil in a saucepan and sauté the shallots until they are soft and translucent. Add the beetroot and cook for a few minutes, then add the hot stock, salt and pepper and let it simmer for about 15 minutes. 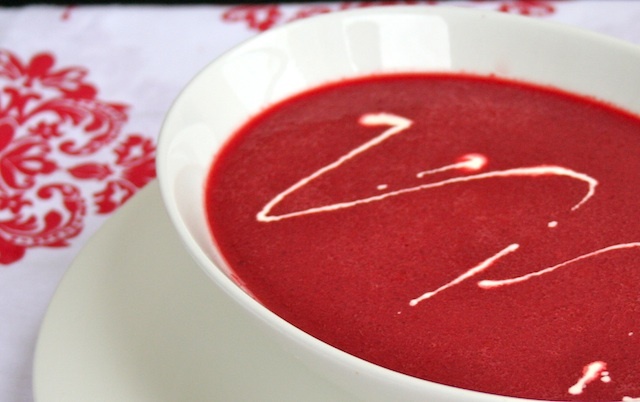 Once the beetroot is tender, use a hand blender and puree the soup. Add the cream, season once more to taste, and let it cook for another 5 minutes. Serve the soup in bowls and add a little swirl of crème at the end. Enjoy!